Shaping EU Public Procurement Law: A Critical Analysis of the CJEU Case Law 2015–2017 studies the continual development of European Union (EU) public procurement law through the case law of the Court of Justice of the European Union (CJEU). Tenderers of the EU Member States have to take into account the interpretation given by the CJEU of EU procurement law when putting into the market their public procurement contracts. Case law evolves quickly; therefore, it must be updated on a regular basis to provide practitioners with actualised and relevant insight. 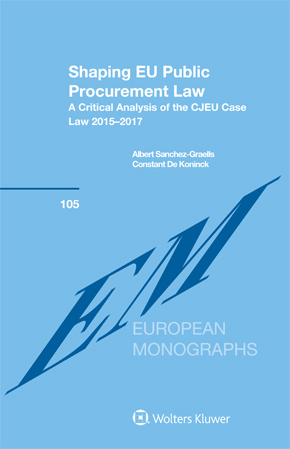 The book shows that the period between 2015 and 2017 has been interesting and rather intense for the development of EU public procurement law, where the CJEU has not only consolidated some parts of its long-standing procurement case law but also introduced significant innovations that can create future challenges for the consistency of this regulatory regime. The book assesses what might be the effect of the new rules in the factual situations considered by the Court of Justice and how they may warrant a different decision in the future. development of interpretive guidance concerning several aspects of the procurement remedies regime. The second part of the book contains the essential excerpts of forty-one chronologically ordered judgments issued by the CJEU in the period 2015–2017, which have been selected because they raise either new issues or important matters of public procurement law. Each of the selected judgments is followed by an exhaustive and critical in-depth analysis, highlighting and providing insight into its legal and practical issues and consequences. An exhaustive subject index offers the reader quick and easy access to the case law treated in this book. This unique, well-reasoned book on judicial legislation in EU public procurement and concessions law is a ‘must-have’ reference work for judges and courts of all EU Member States and candidate countries and academics and legal professionals who are active in the field of procurement law. This book will also be valuable for law libraries and law schools across the world and for law students who focus their research and studies on EU law.